Coughing is your body’s natural way of eliminating unwanted stuff from your airways. So, it’s not necessarily a big deal when you cough sometimes after eating or drinking — it simply means your body is trying to prevent some particles from going down into your lungs. Coughing after eating or drinking can be very frustrating. Worse, if you have to go into several bouts of coughing every time after taking certain foods or drinks, it means something is wrong with the way your body handles such foods. And you need to find out the cause, since it could be a sign of some serious health problem. Ice cream and cold drinks are notorious for this. Here are 6 common causes of coughing after taking ice cream and cold drinks. If you’ve noticed that you cough only after taking ice cream, then it could be that you’re allergic to dairy products or certain ice cream ingredients. This is more likely to be the cause if you don’t have similar issues after taking other cold foods or drinks. When you’re allergic to certain foods, drinks, or other substances, your body registers them as potential threats that should be eliminated instantly whenever it encounters them. Coughing is just one of various bodily reactions that occur when the body encounters these substances and the immune system swings into action. For many people, dairy is the reason why they cough after taking ice cream. And if you’re one of them, then you would most likely have issues with other dairy products, such as milk and cheese. But if you have no issues with other dairy foods, certain ingredients in the ice cream you’re taking could be the culprit. GERD (gastro-esophageal reflux disease) is another common cause of unexplained coughing after meals in general. But if you first noticed this after taking ice cream on one or two instances, you might be tempted to think that ice cream is the culprit. Truth is, any food could be the culprit. So, if you felt some pain in your chest or upper part of your tummy while you were coughing, you might be dealing with GERD, and in that case every food is a culprit. Here’s what happens in people with GERD: The junction where your esophagus meets your stomach is gated by a thickened ring of muscle called the lower esophageal sphincter. When this sphincter opens at the wrong time or does not close properly, some of the acid produced in the stomach tends to backflow into the esophagus. This happens usually after meals because ingestion of food or drink increases acid production as well as the volume of the stomach’s contents. So, the fuller your stomach, the higher are your chances of having its contents backflow into your esophagus. This reflux irritates the walls of the esophagus, causing cough and chest pain. About 5 – 10% of people cough after taking very cold foods or drinks because they develop a condition known as bronchospasm, which is the sudden tightening of the muscles that line the airways, resulting in narrowing of the airways an ultimately breathing difficulties and cough. While bronchospasm is common in people with asthma and allergies, it does happen in the absence of these conditions, too — such as in reaction to cold foods and drinks. Bronchospasm, when it’s caused by ice cream, is the body’s natural reaction to the sudden exposure of your airways to the extremely cold temperature of the drink. If you’re an asthma patient, then that could be just the reason why you cough after taking ice cream. The cold temperature of ice cream alone is enough to trigger serious reactions that manifest as coughing. Sometimes, it could be due to your body’s reactions to additives, such as sulphites, that may have been added to the ice cream. 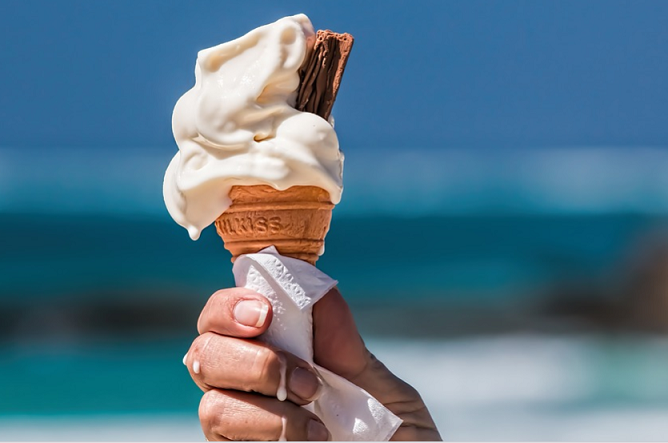 Aside cold drinks such as ice cream, other triggers such as dust, pollen, smoke, and stress are common causes of allergic reactions in asthma patients. If you develop other symptoms such as chest tightness and difficult breathing after taking ice cream, chances are you’re dealing with asthma. Here’s another possible cause of coughing after taking ice cream (hypothetical, though): When you take ice cream, it travels down your esophagus, which is anatomically in contact with the trachea (wind pipe). The cold temperature of the ice cream therefore causes the trachea to cool down, leading to thickening and solidification of the mucus present in the trachea. Ordinarily, the mucus in your trachea should be swept back to your throat in order to clean up the airway. But when the mucus has thickened in response to the cold temperature of ice cream, your body responds aggressively by causing you to cough until all the thickened mucus has been removed. This effect happens after you take ice cream because of its high viscosity — it trickles slowly down your esophagus, spending more time to cool your trachea and thicken its mucus content. This also explains why you tend to produce thick saliva and even phlegm after taking ice cream and other frozen drinks and foods. If you have an infection in your larynx (voice box) or esophagus, then you may experience some cough after eating or drinking anything, not necessarily ice cream. What happens when you have an infection in these parts of your digestive system is that they get swollen and more sensitive, and this can cause them to malfunction or trigger aggressive responses like coughing when food or drink comes in contact with them. Infections can be caused by various micro-organisms such as bacteria, fungi, and viruses, and they require medical attention for them to be properly treated. So, if you’re coughing during or after taking foods or drinks in general, or cold foods and drinks in particular, infections could be the cause. There you have six possible causes of coughing after taking ice cream or other cold foods and drinks. If you’re experiencing this problem, do not panic. Your best bet is to consult your doctor, so the exact cause — in your own case — can be figured out and properly managed. But before seeing your doctor, you might want to stop taking ice cream and other foods or drinks that cause you to cough — for the time being. And if you must take ice cream before seeing your doctor, be sure to take it slowly and in little amounts at a time.